8:30 am, 11:20 am, 11:40 am, 12:15 pm, 1:10 pm, 1:20 pm and 3:10 pm depending on the selected day. Take the underground tour of Colosseum on a dry day. We are comparing Ancient Rome Colosseum Underground, Arena & Forum Tour Prices from leading ticket suppliers and Try to find you Cheap tickets prices on the market. The guided tour leads travelers into the very heart of the Roman city. The walking tour introduces areas essential for political, religious, secular, commercial and entertaining activities in the Roman Republic and Empire. The activity reveals behind-the-scenes areas of the Colosseum, the biggest entertainment facility of the mighty empire during its heyday. In the underground areas of the huge amphitheater, stories about gladiators become alive. In the Roman Forum, tourists visit the remains of temples and grand monuments, including the Temple of Vesta and the Septimius Arch. From Palatine Hill visitors admire views of the Forum, Colosseum, Capitoline and related attractions. Joining the tour is the right thing to do for every traveler since being in the Eternal City is unimaginable without visiting the related attractions. Besides the structures, the tour reveals facts and stories underlining their true significance. Besides, the fans of art, culture and legends shouldn't miss this activity. Your Experience With Ancient Rome Colosseum Underground, Arena & Forum Tour? Visit the chief points of interests of the major city in the Roman Empire on a guided tour - Colosseum, Roman Forum and Palatine Hill. Access generally restricted areas of the Colosseum that were essential for the functioning of the biggest arena in the world in its time. Visit areas reserved for gladiators and animals, and learn intriguing stories related to them. Feel like a gladiator when entering the big arena surrounded by a huge auditorium. Visit the Roman Forum, a secular and religious hub of ancient Rome. Enjoy views of the Forum, Colosseum and the Circus Maximus from Palatine Hill and explore ruins of once luxurious Roman villas. What Ancient Rome Colosseum Underground, Arena & Forum Tour Includes? Knowledgeable art historians assisting as tour guides. Headphones allowing you to hear the guide clearly in busy tourist areas. The expedited admission without waiting in long lines. Plan as much time as possible for visiting the attractions covered by this entertaining and educational tour. The more important spectators were, the nearer to the arena they were seated - the emperor and the aristocracy sat in lower tiers, common people in higher. Palatine Hill used to be the first inhabited area in Rome. Travelers Reviews about Ancient Rome Colosseum Underground, Arena & Forum Tour? The majority of travelers wholeheartedly recommend this tour to future visitors of the Eternal City. Participants in the tour were very happy about visiting "backstage" areas of the Colosseum and learning their significance. 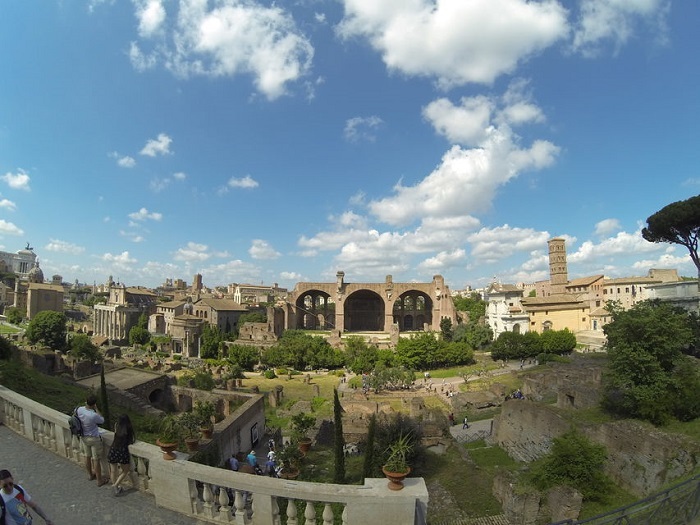 Many customers underline that the tour of the Roman Forum was the highlight of this activity. The reviewers have a great opinion about the guides, their conduct, knowledge and overall performance. According to a few comments, there is a possibility of closure of the Colosseum underground area in the case of rain. People with immobility issues can't be accommodated during the underground visit. You need to present either a mobile or printed voucher to join the activity. For cancellations at least 24 hours in advance, you obtain the entire sum paid for the ticket. Average fitness level is desirable for taking the tour because of a moderate amount of walking. Wear suitable clothing according to the weather conditions because this tour is an open-air activity. You may not bring in large backpacks or luggage into the related attractions. Security checks may prolong waiting times at the entrances.